Oh wow, that copy of Samba De Amigo even has the limited edition font! Such a rarity. Awesome find, Ad7. Cool gear, Ad - I've never played the game but I've heard great things about it! I like your approach of playing a back-up copy whilst keeping the original in mint condition . 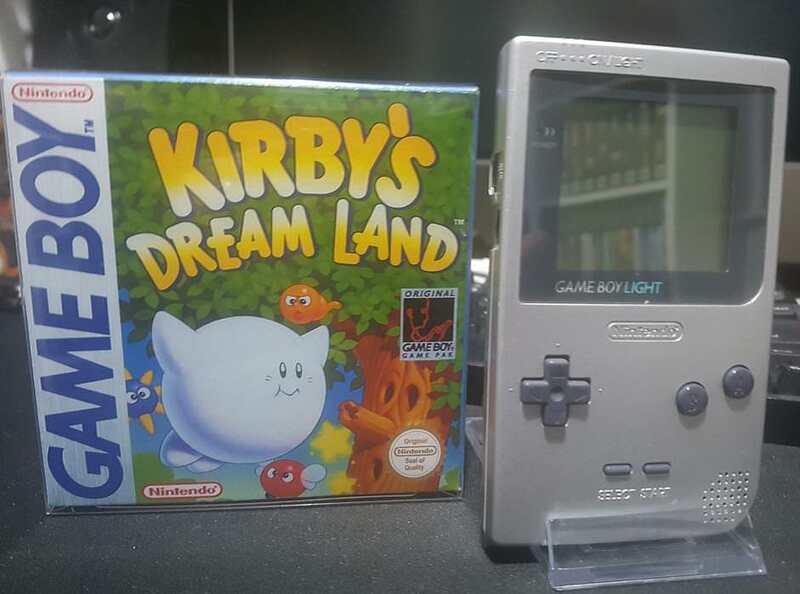 Added a new system to the collection during this last week, a particularly obscure one as it was never released outside of Japan, the Game Boy Light! For those who don't know it was essentially an official backlit update of the Game Boy Pocket. Size and weight are almost identical but it takes two AA batteries (Rather than the AAA batteries the GB pocket used) and as a result has an unusual battery compartment that has a comfortable grip to it. At the top the on/off switch is in the usual place but moving it an extra place to the right turns the backlight on. I remember reading about it in N64 magazine many years ago and always liked the idea. I've watched a few on eBay over the years and they seem to be attainable at a reasonable price so I finally decided to add one to the set. Got a good price on it in an auction, it has a few little scuffs around the cartridge port and there's some minor damage to the sticker on the back too but asides from that it's in fantastic condition. 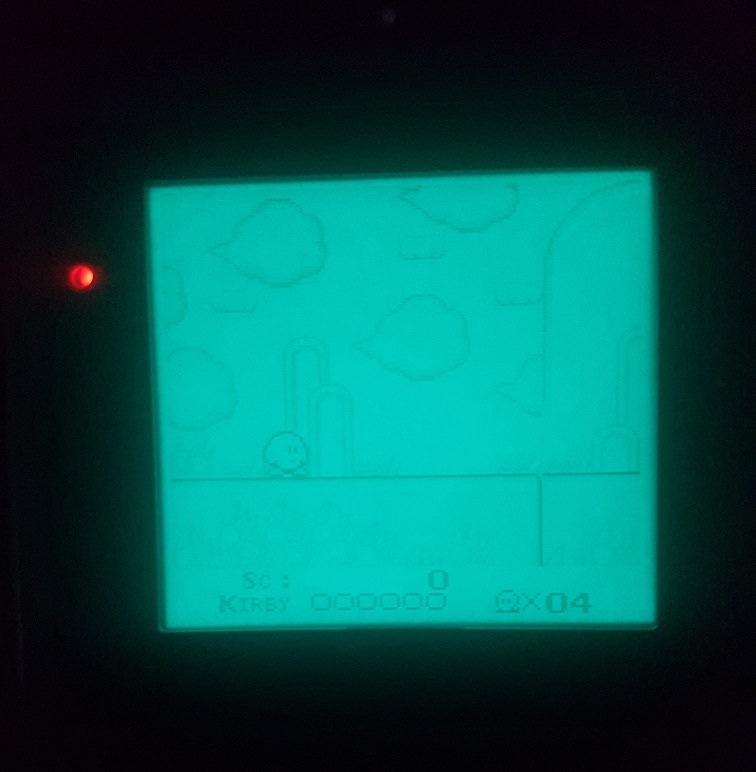 The backlit screen and Kirby in action. As you can see it has a greenish tint to it which is quite unusual but it's pretty clear (although movement can be a little blurred as with any of the non colour models) and very bright! The GB Light in my gaming set up along with my collection of games and the other systems in the Game Boy family. Of the two GBA's the clear one is my original launch day GBA whilst the Purple one is a modified one with an AGS-101 screen. Jamo3103 wrote: Added a new system to the collection during this last week, a particularly obscure one as it was never released outside of Japan, the Game Boy Light! For those who don't know it was essentially an official backlit update of the Game Boy Pocket. Size and weight are almost identical but it takes two AA batteries (Rather than the AAA batteries the GB pocket used) and as a result has an unusual battery compartment that has a comfortable grip to it. At the top the on/off switch is in the usual place but moving it an extra place to the right turns the backlight on. A lovely find! Especially if you got it for a good price. I see these often go for hundreds. Looks in great condition too! Interestingly the screen in those are actually blue with a white backlight. The blue colour is to help with contrast, as putting a white light behind the screen would make everything too washed out. This is way before the technology available to us now, what with bivert chips and led backlights. Also there's a extremely rare pokemon pikachu edition which only about 1000 were made. I've got a thing for handhelds. Really want a full game boy collection but it's a financial waste especially for the micro! Thanks! I didn't know that about the screen, that's really interesting and makes a lot of sense. Despite the colour the image still looks surprisingly good considering the age of the technology. The games still look better on the AGS-101 screen on the GBA of course but it's still a really nice handheld to use. I got it for just over £60 on an auction which I was really happy with, from the front I really can't find fault in the condition. The back sticker is as I say a little damaged but really can't complain for the price. Johnny Ryall wrote: I've got a thing for handhelds. Really want a full game boy collection but it's a financial waste especially for the micro! Big fan as well, probably spent more time playing on my Game Boy when I was younger than any home systems as I did a lot of travelling with my parents. The original Game Boy was my first Nintendo system (and first real console of any sort!) so it will always have a really special place for me. Game Boy Micro costs have definitely shot up, I remember getting mine really cheaply when they were selling them off. The screen is lovely but I never found it particularly comfortable, the original GBA definitely had the best feel to it, just a shame it had the worst screen! Jamo3103 wrote: Thanks! I didn't know that about the screen, that's really interesting and makes a lot of sense. Despite the colour the image still looks surprisingly good considering the age of the technology. The games still look better on the AGS-101 screen on the GBA of course but it's still a really nice handheld to use. Thats a great price! Was that a UK seller too? Meh you don't look at the back when playing a game as long as the front looks good! You need to be really lucky with micros. I've bought three of them. Bought 2 of them together for £20 and another one with some games for £20. Sadly all pink but all work and still do the job! All three I found on Facebook market place and I just got really lucky, right place right time. The Doom Spoon wrote: Thats a great price! Was that a UK seller too? Meh you don't look at the back when playing a game as long as the front looks good! Yeah this particular seller had sold a few in the last month on buy it nows ranging from a really beaten up one at around £50 to one in a similar condition to the one I got at about £90. He left this one to auction and I got lucky with a late bid! This might be a bit of a niche question but there's a series of stickers you can get for cart only N64 collections that go on top of the cart so you can tell which game is which when they're on the shelf - I don't suppose anyone knows where to get these? I always lusted after the pocket version and hoped one day I'd be able to get one (would have been my parents buying). 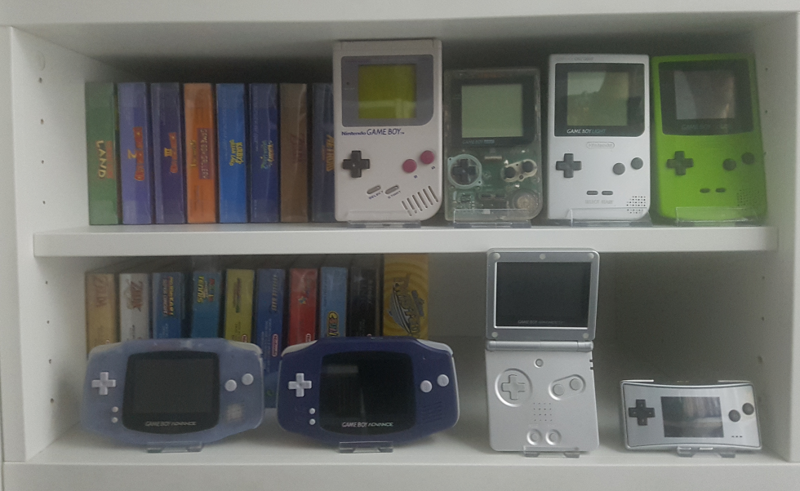 I still have all my gameboys (original, colour and advance), so many happy memories from them - getting donkey Kong land in America and playing that in between going to theme parks, playing the best Zelda - links awakening over and over again, then getting it on gameboy colour and playing it over and over again. Corazon de Leon wrote: This might be a bit of a niche question but there's a series of stickers you can get for cart only N64 collections that go on top of the cart so you can tell which game is which when they're on the shelf - I don't suppose anyone knows where to get these? Would these be what you're after, Cora? Or, if you're willing to pay a bit more, these ones look decent, too. That is exactly what I'm looking for, thanks Jawa! Those cart labels are pretty darn decent. This was my fave purcase of the month would prefer it didnt have the old gamestation stickers but for £15 I am not going to moan and I dont want to risk ruining anything getting them off. kerr9000 wrote: Those cart labels are pretty darn decent. Lighter fluid will fetch them off cleanly. Lighter fluid . Oh maybe ill see if I have a more rubbish game with a label on I can try to take off and then do Vandal if I am happy with the results. kerr9000 wrote: Lighter fluid . Oh maybe ill see if I have a more rubbish game with a label on I can try to take off and then do Vandal if I am happy with the results. Leave it to soak for a minute or two, then peel off and wipe clean with a damp cloth. Job done. If you're very careful you can prize the cover off, remove the artwork slip from it and then soak it on it's own. You guys use weird chemicals. Use ethanol / methylated spirit / isopropyl alcohol it cleans anything shiny with no damage. Screwfix £4 or so. I clean windows until they look new for sign installations. For dirt on stuff I just use flash wipes, I use them carefully on manuals and magazines. Meths or alcohol dissolve ink, don't do that on printed stuff. I'm not a mint condition freak or anything but there's a small crack in the top corner, so I'd suggest just getting a new case rather than faffing around with alcohol/meths. Cleaning it up might just make that small imperfection you can't change show up more. I had noticed that, I figured at some point id look at one of my other PS1 games see if I have a perfect case on a football game or something so I can do a swap... the stickers unfortunatly are on the paper not the case though.